Veering away from the academic norm (Bultmann, Theissen, Dibelius) that has historically focused on the actual phenomena and messages in the New Testament miracle accounts, Cotter brings attention to bear on the way Jesus responds to the petitioner--and what the anecdotes reveal about his person, character, and power. 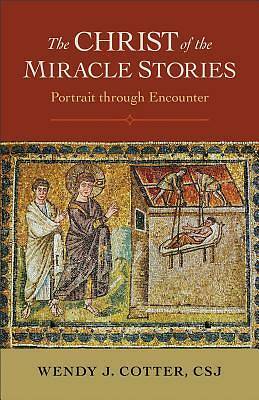 She addresses the function of the miracle stories prior to their incorporation into the gospels, contextualizes the behavior and speech of the supplicants against the cultural backdrop of the Greco-Roman world, and reveals the example--and challenge--of a compassionate Christ in situations that reveal not only his power but also his "soul," as Plutarch would say.The Christ of the Miracle Stories is divided into four sections, according to the relationship of the petitioners to the needy person. Each chapter begins with an original-language rendition of the featured text with a fresh English translation. Individual anecdotes are then analyzed for editorial revisions in order to clarify and affirm their message. Detailed character studies of seekers and Jesus as presented by the gospel narrators are thoroughly discussed and set against their cultural venue, as is the way in which Jesus' "virtue," his narrated portrait, is revealed. Scholars, students, and interested laypersons will find Cotter's revelatory descriptions and conclusions and her carefully explained method of exegesis very helpful in their own exploration of the New Testament miracle stories. Copious footnotes, indices, and a bibliography add to the volume's usefulness.